Exactly two weeks ago, I was dining with a friend and we were sitting outside (one of the first days with nice weather here in The Netherlands) and next to us, there was a table with three guys. One of them was wearing a Patek Philippe Nautilus in red gold. Although, that is what I thought it was at first glance. In the evening dusk, and without my glasses it was hard to identify it correctly the first time. However, giving it a better try, I noticed this was a replica version of the Nautilus in red gold on leather strap. The edges were way too round, the strap was crappy and the bezel was too thick. Furthermore, the dial was far from refined as Patek Philippe makes them. Even though a real Patek Philippe of this caliber is only in reach for the lucky few and Patek probably wouldn’t lose a dime over this guy [wearing a fake], I don’t think it is chic to have a fake watch. It becomes even more pathetic when people try to make other people think it is an authentic watch. I recall an interview with a famous (Dutch) lawyer in a Dutch watch magazine, that he threw his Rolex Submariner overboard in one of the Amsterdam cannels after getting remarks about him wearing an expensive/gaudy Rolex, just to impress his friends that he didn’t care about the money. It was a fake Rolex. Poor guy, caring about other people’s opinions about his watch AND wearing fake watches. Get a (mechanical) Swatch if you want to own a Swiss brand for little money. But in most (or perhaps all) cases it’s not about the watch, it is about the brand name…. Together with the Federation of the Swiss Watch Industry, Haute Horlogerie has a programme on counterfeit watches. Fake Watches are for Fake People. This programme is about creating awareness about the damage that these replica products (watches in this case) are causing globally. 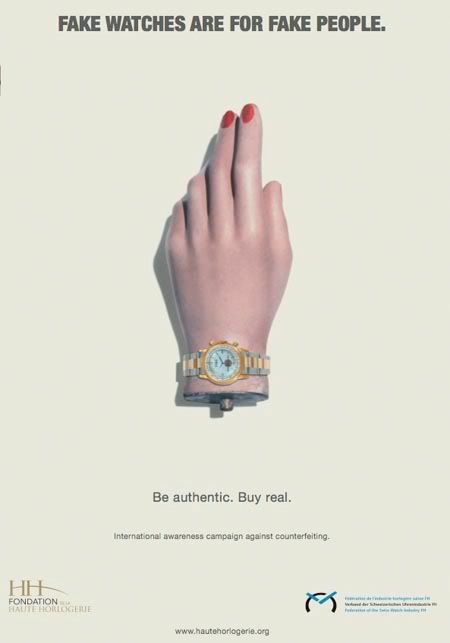 Although I wonder what the real losses are caused by people who buy fake watches, I certainly support this anti-counterfeiting campaign wholeheartedly. The famous Dutch lawyer (probably) can easily cough-up the money for a real Rolex, the guy sitting next to me at the restaurant probably would have some trouble getting that red gold Patek Philippe (assumptions, I know, but for this illustration it will do :)).